Dear Mairuru, I am not a native speaker myself, so all I can think of is "A dog brings a flower pouch". I just wanted to tell you that I admire your work very much. I mentioned you again in my blog (it is in German, but I could translate for you), again referring to your way to honor holes in garments. Only recently I found out about "Kintsugi" and "Boro". Maybe I am wrong, if I see this tradition in you work, too? Well at a wedding we have "flower girls" maybe this is a "flower dog", just like you have a sheep dog to bring the sheep home. I think you should honor your language, as long as you interpret for us. 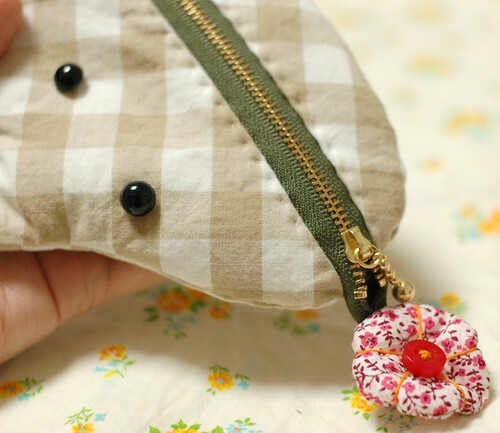 On my extremely limited Japanese language I would say something like "Inu to Hana Pouch" (dog and flower pouch). Aloha! I've really been enjoying your Sarubobo projects and look forward to seeing your new creations. 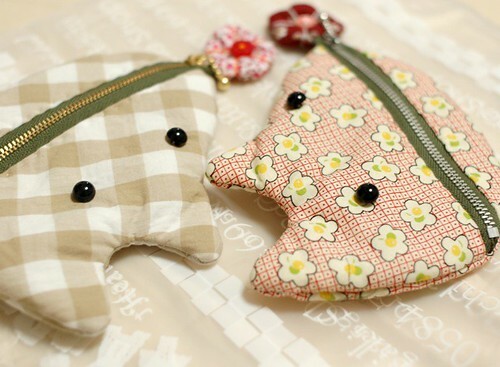 I was first brought to your blog by your wonderful cat purses - so clever and just adorable. The dogs are also cute - what about calling them "Fetch". I love everything you make and am a big fan of your blog. I really appreciate that you offer such great tutorials, always very detailed with lots of pictures. I now have a few sarubobos sitting pretty on my table... As for naming your projects, I think you should use more japanese words, since this is who you are, and just translate in the item description. I know for sure that I would not hesitate to name my projects in French, if I were to create something. Hi Mairuru, your work are always very sweet. 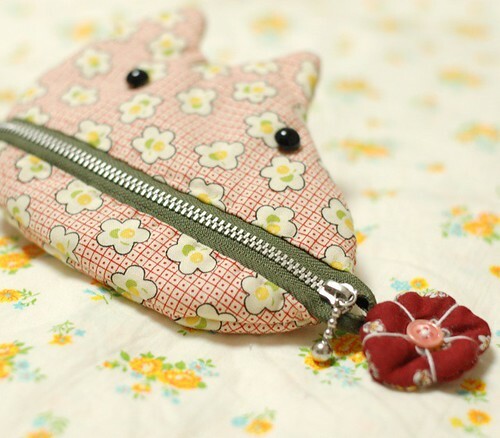 what do you think about "doggies flower"-pouch? what do you say about Puppy and a flower, or Dog's little flower, Cute dog& cute flower. I think it would be cute to name it. Flower Pooch Pouch. Pooch is another word for dog. You do such cute and clever things! I could ask my daughter, she is studying Japanese in Osaka. Thank you! Thank you very much for everyone! You gave me great ideas! Sometimes I put Japanese name on my items, but I honor other languages too and I want to put understandable name for costomers, and most of them are not Japanese. Thank you very much for all of your kindness! I'm thinking to name it, "Flower dog pouch" or "Flower pooch pouch"! You could name it "Fido's Flowers Pouch." A long time ago people used to name their dogs "Fido" because it means "loyal" in Latin. 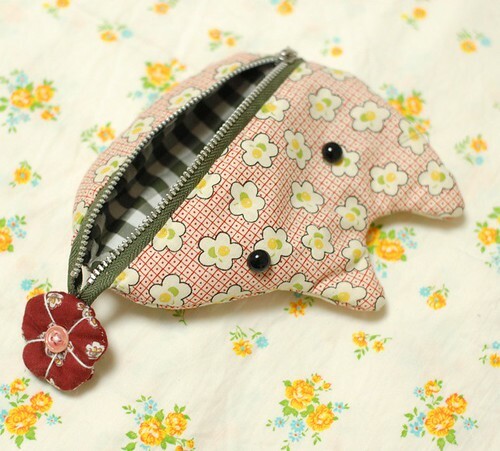 "This adorable puppy coin purse is sure to bring a smile to the face of any animal lover. Give him a good home today and he will fetch you a flower any time you want." Feel free to use that exact wording for your shop if you want. Also I'm an American so there's no need to worry about anything being lost in translation. I just found your blog today...I love your work Mai! I've just made my 1st sarubobo for my son, thanks for the instructions. If you turn your pouch upside down it looks like a tooth, like a tooth fairy pouch. That is what i thought it was at first and it took me a while to see it as a dog. Super cute, i love it upside down or right side up. Loved to name my quilts also! I'm Brazilian and speak very little English. Isadora (http://doraquevedo.blogspot.com/) is helping me out with this e-mail. Your works are beautiful and your tutorials are great. Although I understand very little English I managed to make myself a Sarubobo very easily, your photos are very clear. I would like to show you my first Sarubobo. Here's the link: http://vanessabmpontocruz.blogspot.com/2009/06/meu-primeiro-sarubobo.html. I followed your tutorial but used felt instead of fabric. I embroidered some little flowers on the felt (around the Sarubobo's "waist") before sewing. I also added a little hat (a 5cm circle) to hide the wrinkles on the head. Felt is very thick and wrinkles easily. I loved making the little Sarubobo and I intend to make others. Thank you very much for sharing your knowledge. I will go on following your blog. Thank you very much for your comment. I liked the frase very much. Thank you very much for making Sarubobo! I love yours! And thank you very much for reading my English. and,,, Thank you very much for writing English for me! Dingo looks like Japanese Shibainu! Hello! I absolutely think you could name them in Japanese! I think that would make them just absolutly lovely!